The cast of “Ruthless! The Musical” – Courtesy of Ed Stewart. Used with permission. 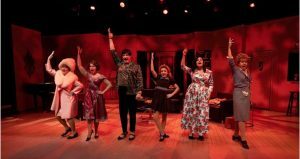 Prepare to check all logic at the door when you see Actors Theatre of Indiana’s production of “Ruthless! The Musical,” which I attended January 27 at the Studio One Theatre at the Center of the Performing Arts campus in Carmel. 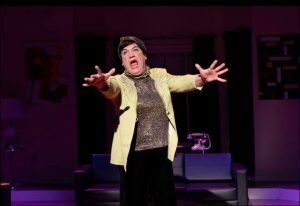 With book and lyrics by Joel Paley and music by Marvin Laird, the campy spoof of Broadway shows stretches all credulity and was created to be silly, mindless fun. You don’t have to be familiar with the musicals “Gypsy,” and “Mame,” and films “All About Eve” and “The Bad Seed,” but if you do, you will enjoy the all-female (kinda) show even more. “Ruthless” tells the story of a clueless housewife Judy Denmark (Judy Fitzgerald) and her precious, but cold-hearted 8-year old daughter Tina (Nya Skye Beck). Encouraged by her ruthless manager Sylvia St. Croix (John Vessels), Tina is determined to get the lead in her school play, directed by prickly teacher Miss Thorn (Cynthia Collins). Tina will do anything, including offing the leading lady, which eventually gets her sent to a reform school. In the meantime, Judy finds out from her adoptive mother Lita Encore, who is also an acerbic theatre critic (Suzanne Stark), that her birth mother was a famous actress. Judy concludes that she wants fame too, so she becomes a Broadway star, assisted by her scheming protégé Louise Lehman (Laura Sportello). John Vessels as Sylvia St Croix – Courtesy of Ed Stewart. Used with permission. Co-directors William Jenkins and Matthew Reeder were skillful at guiding this well-cast ensemble, all of whom exhibited flawless timing and comic flair. While each of these actors was adept in their characterizations and gave fine vocal performances, Vessels, as St. Croix, and child prodigy Beck, as Tina, stood out for the potency of their performances. Vessels, whose expertise at female impersonation bowled me over when I saw him bring down the house in his December cabaret show “A Lillian Baxter Christmas,” impressed me once again, this time, as Sylvia St. Croix, sort of a cross between Rosalind Russell and Bea Arthur. He is a one hell of a great illusionist. Fourth-grader Beck who sang, danced and acted like the pro she is was remarkable for her poise and the ease she showed on stage. What a rare talent she is. As far as the show’s technical features, P. Benards Killian’s set, Stephen Hollenbeck’s costumes, Andrew Elliot;s wig design, Zach Rosing’s lighting design and Quinten James’ lighting design are all praiseworthy. Nya Skye Beck as Tina – Courtesy of Ed Stewart. Used with permission. Completing the show’s top notch team is Carol Worcel who choreographed and music director Keith Potts who plays keyboards along with veteran musicians Greg Gegogeine on bass and percussionist Greg Wolff. If you are looking for pure escape, there is no better way to experience it than seeing the absurd farce that is “Ruthless! The Musical.” It’s rib-tickling entertainment guaranteed to lift your spirits during these dark days of winter. For tickets and information about “Ruthless! The Musical” call (317) 843-3800 or visit atistage.org.